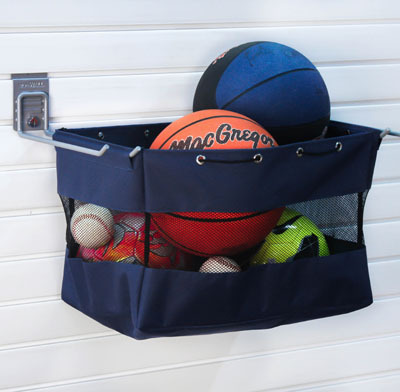 Sporting goods, clothes, rags, garage items and more can all be stored the new StoreWall Grab Bag – Small. Made of durable, heavy duty canvas, the Grab and Go Bag includes a mesh panel all around for visibility and cirulation. 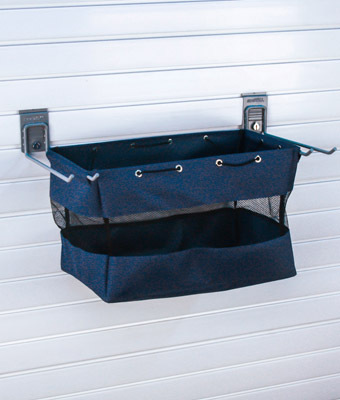 Fastens onto slatwall panels with two 12″ StoreWall Universal Hooks. Fits StoreWall, HandiWall, and standard 3″ on center slatwall panels in which the slot goes straight in and straight up. Also available in 2 other sizes: Grab and Go Bag – Large and Grab and Go Bag – Medium. Use it to store items in the garage, kids’ rooms, pantries, laundries or wherever you have slatwall installed.